The 37 mm Gun Motor Carriage M6 (GMC) was the first American tank destroyer of the war. It was designed in a rush. When America declared war on Japan on 8th December 1941, Japan’s allies, Germany and Italy, declared war on the United States, bringing America fully into World War II. The United States Army needed to equip its infantry units with a mobile anti-tank support weapon. At that stage, the 37 mm (1.46 in) Gun M3, introduced in 1940, was the standard anti-tank gun of the day. The 37 mm calibre was thought to be effective against Japanese armored fighting vehicles and the 1940 generation of German tanks that were used to invade Poland and France. By early 1942, trials began. 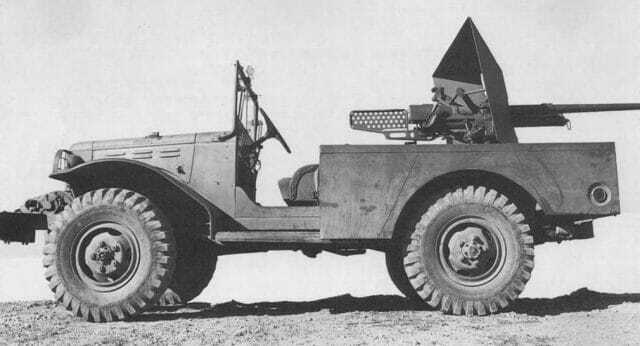 The designers soon found out that the standard Jeep was not suitable to take the 37 mm gun’s recoil when it was fired. A new gun platform vehicle needed to be found. The Dodge WC 52 3/4 ton truck looked like an extended Jeep. It was the only vehicle available in large numbers that could be quickly converted into an anti-tank weapon. It was also the cheapest at only $4,265 a piece. A 3-inch GMC M10 Wolverine tank destroyer cost $47,905. The M6 Fargo soldiered on to the end of the war. Other companies were involved in its construction. Dodge built over 5,300 vehicles, although not all were armed with the 37 mm. By November 1941, US Army ‘tank attacker’ formations were created to support infantry units. They were tested in war game exercises in the Carolinas with some success. By late 1941, it was proposed that Tank Destroyer (TD) battalions be created. One was to be assigned to each division plus 165 additional ones at the disposal of the US Army General Head-Quarters (GHQ). On 27th November 1941, the first of the 53 TD battalions were created, controlled by GHQ, headed by Leslie McNair. They preferred cheaper gun carriers for this purpose and not tanks. The impetus of an aggressive armored fighting unit’s mobility was hindered by the use of towed anti-tank guns. The en portee self-propelled gun (SPG) solution was believed to be the best solution. 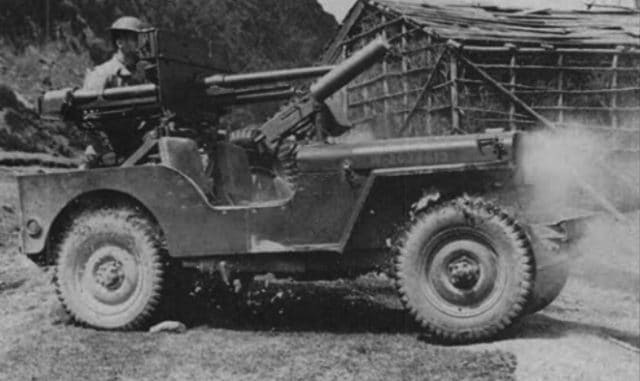 After the unsuccessful trials of mounting the 37 mm (1.46 in) M3 gun on Jeeps, the same gun was mounted on longer, sturdier 3/4 trucks, with a better range, room and ammunition storage facilities. In the summer of 1941, the prototype was given the project name of the T21. The T22 was the developed alongside, a larger armored 6×6 vehicle that will lead to the M8 Greyhound armored car. The various tests on the T21 included rear-mounted and forward-mounted guns. The production model was going to be called the ‘M4 37mm Gun Motor Carriage’ but this was quickly changed as the ‘M6 37mm Gun Motor Carriage’ to avoid confusion with the ‘M4 37 mm gun carriage’ which was a towed anti-tank gun. The Dodge/Fargo series of light military trucks were mass-produced: over 255,000 were produced and 5,380 were converted into M6 37 mm GMCs. The final M6 was developed from a 3/4ton 4×4 Dodge WC52 truck, a combination that was factory designated the WC55. The vehicle was totally unarmored, except for the large 0.25 in (6.4 mm) thick gun shield, which only protected the crew when facing the enemy. Caught from the side or the rear, the crew were open to injury from small arms fire and exploding high explosive shell shrapnel. The rear of the vehicle’s chassis was fitted with a star-type riveted pivot and the gun was normally fired to the rear. When fired forward, the gun could not be fully depressed, and the blast could shatter the windshield and injure the driver and co-driver. Firing from the rear, the gun shield also protected the driver and it facilitated a quick escape or change of location. The vehicle was capable of carrying eighty rounds. There is no photo evidence so far of additional armor being mounted on the vehicle. The M6 GMC offered good off-road capabilities thanks to its large roadwheels and semi-elliptic leaf spring, although it was inferior in cross country performance to the half-tracks, especially in the muddy winter months in Tunisia. Its Dodge T-214 6 cylinder 4-cycle inline gasoline engine developed 99 hp (74 kW) for a 29.7 hp/metric ton power to weight ratio and top speed of 55 mph (89 km/h) on road. Its operational range was about 180 miles (290 km) by road. 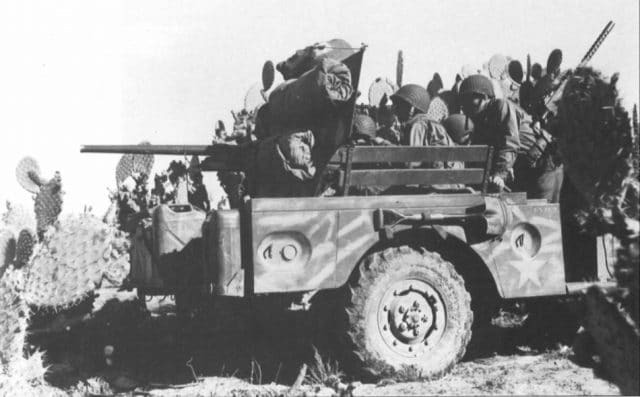 M6 GMC, 601st TD batallion, Tunisia, November 1942. The 1940 37 mm (1.46 in) M3 gun was produced mainly by the Watervliet Arsenal. It fired the M74 Armor Piercing (AP) shot, which could penetrate 1.4 inches (36 mm) of armor at 500 yds (460 m). In order to improve performance, the Armor Piercing Capped (APC) M51 projectile was fielded. It could penetrate 2.4 in (61 mm) of armor at 500 yds. The High Explosive (HE) M63 Projectile was also used as an anti-personal round. The gun could depress from -10° to +15°, had a 60° traverse, and a 25 rate of fire per minute with a well-trained crew. The ammunition round’s dimensions were 37 mm × 223 mm. The breech had a vertical block, the recoil lessened by an hydrospring. The muzzle velocity was 884 m/s (2,900 ft/s) and it had a maximum range of 6.9 km (4.3 miles). The design was standardized in February 1942, production started in March, and lasted until October, when the 5,380th came out of the factory floor. It was the first and most current American tank destroyer when the 1st Division, the “Big Red One”, landed in Tunisia, North Africa for Operation Torch. Two units used them, the 601st and 701st Tank Destroyer Battalions, until early 1943. The initial idea of using three tank destroyer units, one light, one heavy and one towed was soon abandoned. A mixed heavy (M3 75mm GMC) and light (M6 37mm GMC) unit was introduced before the landing in North Africa. By early 1942, the British 8th Army reported that their 2 pdr (40 mm) gun was already no longer sufficient and their 6-pdr was preferred (soon copied by the US and called the 57 mm M1). It was found the smaller caliber gun could not penetrate the uparmored German tanks. The US Army was aware of these reports but still deployed these now obsolete guns in North Africa. 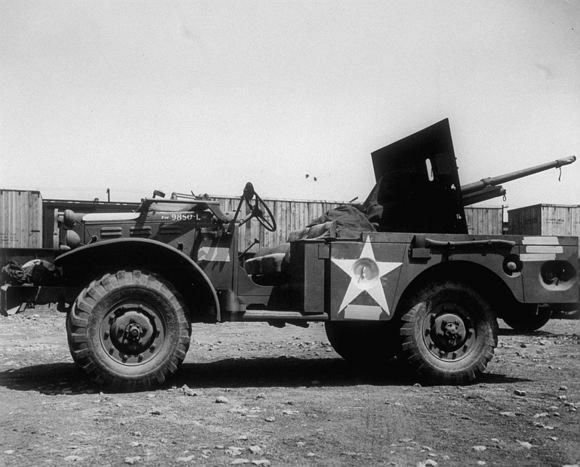 The M6 GMC rapidly became disliked by its crews and the vehicle was sent on to the Pacific Theatre, where it served in 1943 and 1944. 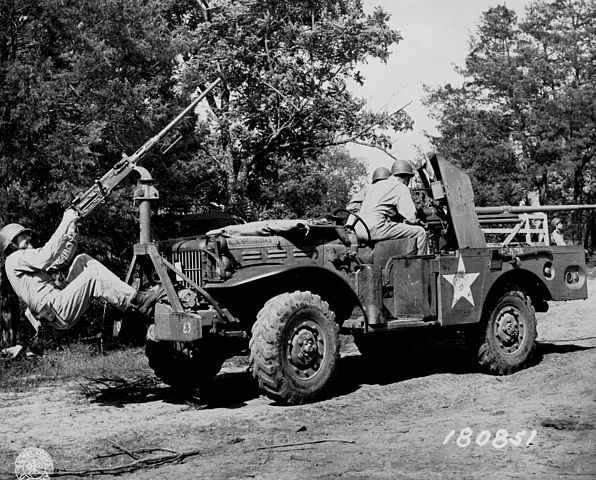 Knowing the standard M3 gun was now obsolete, the US Army planned its successor. The M3 GMC and T12 GMC replaced it, based on the standard White M3 half-Track. The M6 GMC was declared ‘limited standard’ in September 1943 but its use lasted until January 1945 when it was finally declared obsolete and retired for good. Its North African service left the impression of a failed expedient, its gun described in reports as “woefully inadequate” against German armor. By mid-1943, remaining M6s were converted back into WC carriers, while the 37 mm guns were mounted onto M2 halftracks as the M2 w/ M3 37 mm. These were used by the armored infantry, and were others given to the French Army, which later made their way with FFI (Interior French Forces) in France. They were used due to a lack of better solutions from the liberation until 1945. Comparatively, the M3 GMCs gave far better results. US tank destroyers in combat, Steven J Zaloga, 1996.